A team of scientists from I.M. Sechenov First Moscow State Medical University (MSMU) have discovered that earthworms efficiently process rice straw and enrich the soil with organic matter, increasing its fertility while preventing the burning of the straw, which takes a long time to decompose naturally. The results of the study were published in the European Journal of Soil Biology. Rice is staple food product for the majority of the Earth's population. The demand for it is constantly growing, and production increases annually. Harvesting and grain peeling leave a considerable amount of crop residue which is not naturally consumed by herbivorous animals, and is therefore burned. Burning causes the emission of greenhouse gases (carbon dioxide and methane) and black carbon, which negatively affect the climate. Therefore, it is important to develop a more eco-friendly method for rice straw recycling. The authors collected soil samples at three regions of Russia where rice is grown: Krasnodarsky Krai, Kalmykia, and Primorsky Krai. In all three regions the rice fields lacked earthworms, and the scientists tested Eisenia fetida, a species cultivated in Russia on an industrial scale for fishing and humus production. The scientists wanted to find out if the worms were able to process rice straw. The team created several mesocosms, closed confinements imitating natural conditions, to study the ratio between the emission of carbon dioxide, methane and organic carbon. The setup tracked the type of soil, the presence of straw, and the number of earthworms in the mesocosm. Each system contained 1 kg of soil with or without rice straw. Finally, different amounts of earthworms were placed into each mesocosm to find out how their activity would influence the concentration of greenhouse gases and carbon input into soil. It turned out that adding rice straw to any type of soil increases carbon dioxide emission at least by the factor of three. The ratio between the emitted CO2 and the number of earthworms varied depending on the soil type. For example, the emissions barely changed when the worms were added to the mesocosms with soil from Primorsky Krai. In other types of soil with rice straw, the emission of carbon dioxide considerably increased after the worms were added. 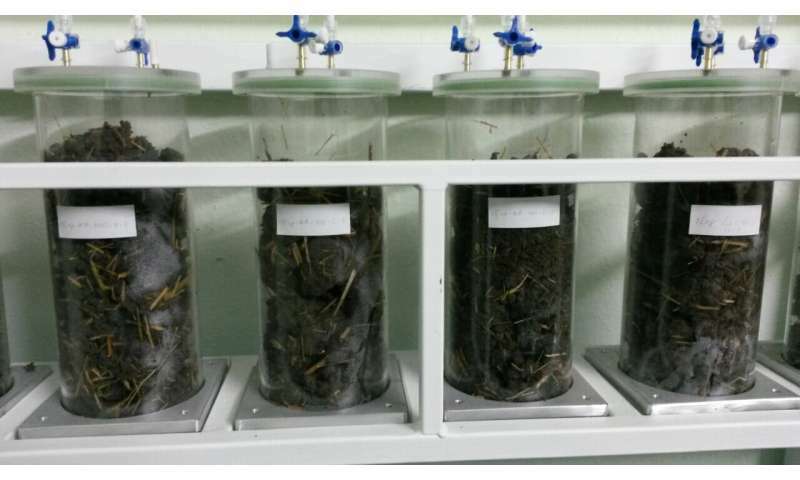 The highest effect in the soils from Kalmykia was reached at the density of six worms per mesocosm, and from Krasnodar Krai at four worms per mesocosm. At the same time, the increase in concentration of organic carbon in Krasnodar soils turned out to be 10,000 times higher than its loss in the course of emissions. When bound with the soil, organic carbon improves fertility and erosion resistance, and when burned, produces carbon dioxide or black carbon. The worms did not influence methane emissions. "This work is of practical importance. We've found a way to efficiently process rice straw instead of burning it, which is currently the most common practice worldwide. Along with increasing the sustainability and climate safety of rice cultivation, it reduces the risks for the environment and mankind associated with agricultural burns as causes of fires and atmospheric pollution, including that with carcinogenic substances. Moreover, adding earthworms to soils will increase the quality, fertility and soil health of the fields and reduce the risk of erosion due to binding with organic substances," said Andrey Zaitsev, a researcher from MSMU.